Alongside Spider-Man, the Hulk, Captain America, Black Widow and the other superheroes of the Marvel Universe is Ms. Marvel... a shape-shifting teen-aged crusader for today's diverse American society. She may be a newbie in the world of Marvel superheros, but since she burst onto the comic book scene in February of 2014, Ms. Marvel has become a cultural phenomenon. She's also the first Muslim superhero to have her own dedicated series. "I love this comic because it is diverse, and it shows a side of America that I think comics don't always show," said DeeDee, a Ms. Marvel fan we met at a Huntington, New York comic book shop. "She's not only dealing with school sides of things, like the culture clashes, her parents want her to be more traditional," said Lois Alison Young, a school teacher who is also a Ms. Marvel fan. "I guess it's a big cliché but she's really struggling because she wants to maintain her Muslim identity." 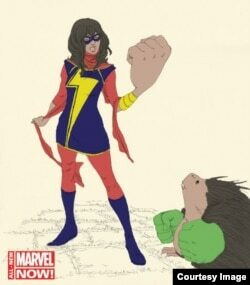 Ms Marvel is a Pakistani-American teenager from Jersey City named Kamala Khan. Her creator, G. Willow Wilson, is also Muslim. "She faces a lot of challenges that any teenager faces about family, school, peer pressure, what she wants to do with her life," Wilson said. "So the real goal is to make the book feel real. How can any reader from any background see themselves in this Muslim girl in the Marvel universe." Comic store owner and Orthodox Jew Menachem Luchins welcomed Ms. Marvel fans to meet the author, and says he can relate to Kamala. "There's a scene where Kamala goes to the mosque and she's talking about the responsibilities she has towards people, so it's vaguely implying that she might be a superhero, but she doesn't want to tell the imams," said Luchins. "I have those hypothetical conversations with rabbis in my head. 'If I got superpowers, would I be allowed on the Sabbath to break Sabbath law to use my superpowers?' These are the things that I thought of, so Ms Marvel connects with me immensely." Kamala Khan's home town, Jersey City, is one of the most culturally diverse cities in the world. "The point of a superhero is to be a symbol for the culture at that time," Wilson said. Kamala Khan's fictional school is based on the real McNair Academic High School. "It's pretty awesome," said Mohammad Mirza, a student at McNair Academic High School. "She's basically the superhero of our school. I think the comic book represents the diversity we have at our school." "For many people, this character is their only exposure to Jersey City, their only exposure to Islam, to depictions of Muslim people that defies the traditional Hollywood idea of Islamophobic representations," said Holly Smith, a teacher at the school. "So it's just interesting to see, especially in this political climate, how this character has really become such a symbol." In 2015, the first Ms. Marvel graphic novel won the Hugo award, the highest prize in fantasy and science-fiction literature, for the best graphic story.